Il Torrino used to be the defence tower of the original medieval settlement situated on the road between Florence and Rome. As such it is located a little above the Pietrafitta hamlet itself. The tower and building at its feet has been converted into a comfortable and original holiday house for 6 people. 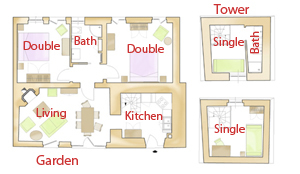 Two single bedrooms, one with its own bath, are up in the tower. On the ground floor, not only living room and kitchen, but also both double bedrooms have french windows onto the garden. Internet access free of charge available in the house. Shared infinity pool (18x6m) for all guests of the estate . Small pool (3x3m) for children.